The month of September would be remembered in Kashmir for a long time now. It makes Kashmir recall the memories of pain, loss and gloom. These are stories which still are discussed and extensively written in the Valley. Last September over flowing Jhelum submerged hundreds of villages, washing away hundreds of structures – goes the clichéd lines which have been repeatedly written, published and read. The waters came, stayed and receded at its own pace, what was left behind was damage, pain, and trauma! Urban floods leave behind huge losses and that is what the 2014 September floods did in Srinagar and parts of South Kashmir. “Gauging the mood of the waters, I knew the damage would be huge but the magnitude would be such, I had no idea,” says Aijaz Khan, the state head of Bajaj Allianz for Punjab, Himachal Pradesh and Jammu and Kashmir. Bajaj Allianz is one among India’s reputed insurance companies and after September floods, as per their official records, became the company which settled the highest number of insurance claims in Asia and paid highest number of claims in a single event. “We settled 32,000 claims and paid almost Rs 1100 crore,” says Khan. Around 2000 claims were motor insurances only, the rest were of business units, residences, and other property setups. Bajaj Allianz is working in Kashmir for past 13 years, since it entered into an agreement with the Jammu and Kashmir Bank, so all the customers who take a loan from the bank automatically get registered with the Insurance Company. This is one of the reasons that Bajaj Allianz has about 45 percent market share in Kashmir. The company is expecting it to go up this year. They expected to settle at the most 6000 claims but the damage turned out to be five times more! The water level started rising in the first week of September snapping connectivity including roads and telecommunication. With no transport available Khan, a resident of Soura, Srinagar on September 7 or 8 managed to cover the distance from his home to Srinagar International Airport and boarded a flight to Delhi. He wanted to reach the head office in Delhi to know the modus operandi. Back home by September 10, Khan sent his team on the ground the very next day. They started from South Kashmir as the water level there was receding. “We started approaching people, consoled them and gave them a hope that if they are already registered with us, we will help them to rebuilt,” says Khan. Khan’s team started collected details from the affected population, which was later verified in the office. In the beginning, asking for documents and proofs would have looked stupid, opines Khan, so the team was verbally collecting the details of their account holders. The details, though, were later properly verified from the official records and almost 1000 fake claims were figured out. Perhaps 300 more are under investigations. The usual workforce of 100 people including 15 surveyors was not sufficient for the insurance company. The company hired at least 110 surveying companies and engaged them to access the damage in Kashmir. Besides, around 80 staff members of Bajaj Allianz were called to Kashmir and were stationed in Srinagar. Explaining further, he adds, it was perhaps the first flood in India where the whole city was under waters. As the water level in Srinagar started receding the team of Bajaj Allianz started resuming their office work. Initially, they started from some branches of J&K Bank which were not affected by the floods, until the essential facilities in their office premises in Karan Nagar were resumed, says a team member Ghulam Mustafa. 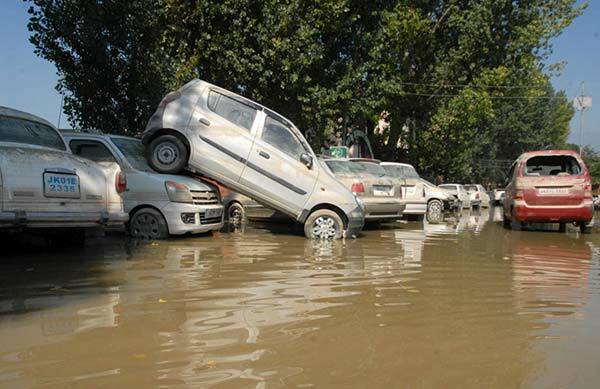 The Srinagar office of Bajaj Allianz resumed its work in the second week of September. The day when Khan and his team returned to Karan Nagar premises where people from across Valley had come to settle their claims. The building was packed with people full of grievance and tales of sorrow. The footfall of people was so high that intervention from security personnel was needed. In the first month only, Khan’s team settled at least 13,000 claims, informs Ghulam Mustafa. He was at the registration desk for all those months when the firm was tackling the crisis. Ghulam Mustafa along with his colleagues used to reach office 10 in the morning and leave by 3 am in the morning. The official record shows almost 96 percent of the claims have been settled and most of them were done in first three months. Their office would be full of people, of different genders, classes and sections. Khan remembers, a man came in our office, he looked disturbed. He came and started shouting indiscriminately. Not remembering his proper details, Khan just remembers the story. Apart from Bajaj Allianz, other insurance companies which did well was New India Insurance based in Kolkata which settled between 7000 and 8000 claims and the third was United India Insurance which catered a few thousand of them. Besides Insurance companies helping people to fight back and diminish the level of trauma, banks also played a significant role. “Playing the developmental role in the revival of the state economy, the bank has taken all possible measures aimed at rehabilitation of units affected by floods,” says Sajad Bazaz, Incharge Corporate Communication Department and CSR, JK Bank. He adds, apart from announcing and implementing relief and rehabilitation package, JK Bank slashed the rate of interests, repayment holiday of two years besides re-structuring of the loan repayments and provisions for fresh loans on softer terms. In total, the bank spent more than Rs 25 crore. As far as post-floods, the bank disbursed around Rs 700 crore additionally through their relief and rehabilitation package in the state. 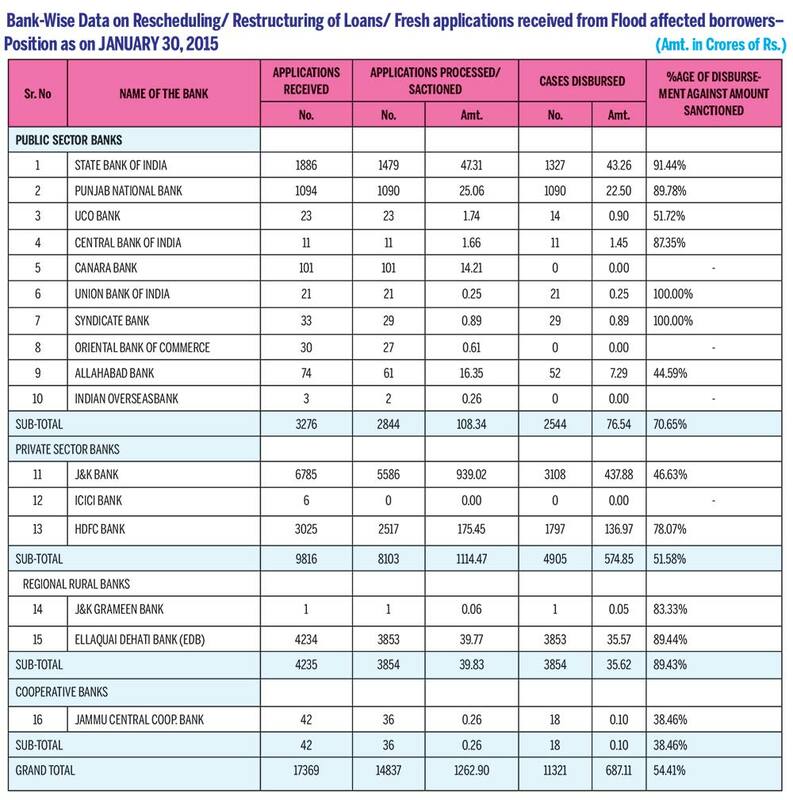 Besides providing the relief, rehabilitation of the flood victims, the bank was used as a channel to receive the relief amount directly from the Government of India. They wanted to transfer the relief amount directly into the bank accounts of the flood victims whose houses in Pucca and Kutcha categories were completely damaged. The government had identified 20,000 beneficiaries. A special meeting of State Level Banker’s Committees (SLBC) held on September 23, 2014, at Jammu for taking stock of the devastation caused by floods in J&K State and devising suitable measures for relief, rehabilitation, revival, and restructuring. to approach GoI for extending interest subvention of 5% up to loans of Rs 5.00 Lakh for the flood victims of J&K State under House Reconstruction Loan Package on the pattern of Ministry of Housing & Urban Poverty Alleviation, GoI, Housing Loan Scheme “Rajiv Rinn Yojana”. to approach GoI for waiver of debts up to Rs 3.00 lacs in respect of the borrowers affected by the floods. to examine the issue of exemption in stamp duty and registration fee on loans for a period of at least one year to the flood victims in all the 20 affected districts of J&K State on the pattern of Uttrakhand. In tourist hub Lal Chowk, SMC toilets close at 6 PM!